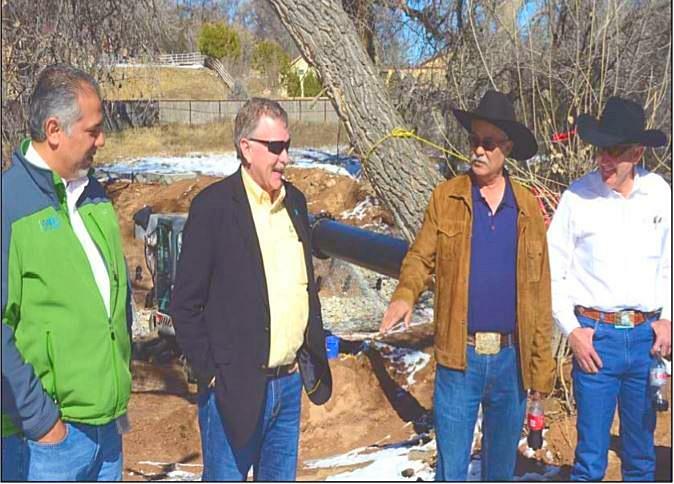 Home » Blog » New Mexico Completes First RCPP Project Using AFA in USA! New Mexico Completes First RCPP Project Using AFA in USA! Xavier Montoya, State Conservationist for NRCS New Mexico (l) listens to Mark Rose (center l), NRCS Director of Financial Assistance Programs manager, talk about the successful partnership and teamwork that led to the completion of the Las Joyas Acequia improvement project near Nambe, New Mexico. Las Joyas is the ﬁrst RCPP project in the United States that used the Alternate Funding Arrangement for project funding. Also attending the event were Kenneth Salazar, former president of the New Mexico Association of Conservation Districts (NMACD); and current NMACD President Jim Berlier (far right).